The most powerful generator controller on the market. Extremely high accurate measurements for: Vac - Aac - Hz - PF - Vac - Vdc - RPM - kW - kVA - kVAr - kWh - PF- BAR - PSI - °C - °F - Temperature. You can use it for industrial engine, pump-set etc. This controller works up to 500Hz. It is the suitable choice for aircraft ground support equipment generators. 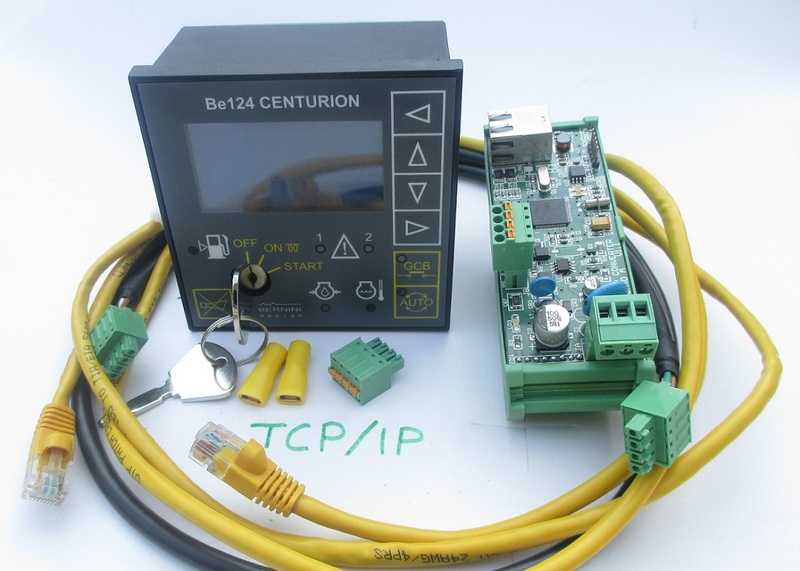 You can connect the Be124 to TCP-IP or GPRS systems. YOU WILL ALLOW YOUR GENERATOR CONTROLLER TO PROTECT THE LOAD AND GENERATOR BY USING A CONTACTOR OF A SUITABLE SIZE VIA A SMALL DRIVER RELAY. As a matter of fact, when you start the engine, the contactor will close after a programmable warm-up time. You avoid to damage the engine by running the engine off load for a while. The contactor will close only if the electrical parameters of the generator are within certain settings. After closing the contactor, the generator controller continuously monitors the electrical parameters providing warnings or a shutdown if necessary. You can set current limits and earth fault current limit as well. Before stopping the engine, the generator controller will run the engine off load in order to cool critical parts of your machine. YOU WILL ALLOW YOUR GENERATOR CONTROLLER TO START AND STOP THE ENGINE BY USING SHORT MESSAGES (SMS) YOU WILL GET FEEDBACK ON MOBILE AS WELL. The Be124 Auto Start features 3 inputs in analog/digital mode and 3 inputs in digital mode only. For each input you can configure up to 15 different options that include warning functions or shutdowns. For the analog inputs you can configure any kind of response curves. An embedded troubleshooting generator controller will allow you to monitor on-site the status of each input. This generator controller monitors generators with 60Vac up to 600Vac voltage ratings and frequency 25.0 up to 600.0 HZ. 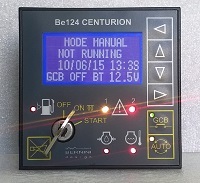 The Be124 generator controller protects generators up to 2000Amps. You can use Single, 2, or 3 Phase connection. You can set up limits for Over-Under voltage, Over-Under Frequency, Overload, Over Current, Reverse Power, Phase-Unbalance. You are required to use a relay  to drive the 'energized to run' FUEL SOLENOID and a pilot relay  to drive the starter motor. You have to use cables of proper size . The Be124 monitors the W.L. belt alternator terminal () to properly terminate the crank. If necessary, you can set up programmable outputs for PRE-GLOW, CHOKE or GAS SOLENOID. 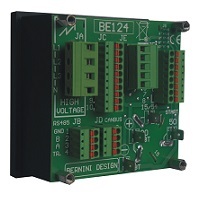 BE124 features an RS485 serial interface that supports the MODBUS-RTU protocol. This serial interface is able to drive a twisted cable of about 1000 m. BE124 features an CANBUS serial interface suited SAEJ1939 compatible engines. The port is fully isolated and protected by reverse voltage. You can choose an engine model from the Engine Type Menu. Generator Controller Cranking Dropout: 0V for a half-second (initial voltage: 12Vdc). Generator Voltage: nominal voltage 70 Vac up to 600Vac (Ph-Ph) 347Vac (Ph-N). Over voltage: 4KVac Ph-Ph. Voltage Measurement precision (V/Hz): +/- 1% F.S.. Impedance: 2 M Ohm. Resolution: 1Vac . Generator Controller Frequency: nominal frequency 20.0 Hz up to 600.0 Hz. Measurement precision: +/- 1% F.S.. Measurement Circuit Impedance: 2 M Ohm. Resolution / Accuracy: 0,1Hz (20.0-600.0Hz). Current Sensing: 5/5Aac up to 2000/5Aac. Maximum permanent current on the sensing inputs: 7Aac. Current Measurement precision: +/- 2%. Internal resistance: 0.05 Ohm. Resolution 0,1Aac (<500/5), 1Aac (>500/5). Digital Inputs: open circuit voltage of approximately 4,5V - Trigger level: < 2Vdc (max 5mA). Maximum Overvoltage: +/-100V 1 s. Permanent short circuit to Bt+ and Bt- allowed for unlimited time. Analogue Inputs: resistance range 0 up to 1000Ohm. Current at zero Ohm: 5mA. Overvoltage +/-100V. Accuracy: 2%. Operating Temperature Range: -25 deg. C up to +70 deg. C. Humidity Range: 5% up to 95% non-condensing. Generator Controller Static Outputs: positive logic / 150mA output current / short circuit proof. 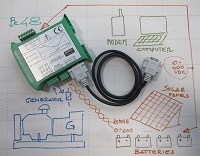 Charger Alternator Monitoring: operating voltage up to 36Vdc/3W. Vdc reading accuracy +/- 2%. CAN Port: fully isolated. 250Kb/second. Internal 120 Ohm impedance available for connection. Supports SAE1939 protocol. RS485 Port: support Modbus Protocol and drives 1000 Metres twisted cable, ESD 2KV & drives up to 127 nodes. The mode of operation of a generator controller is selected via a key switch and an [AUTO] push button. 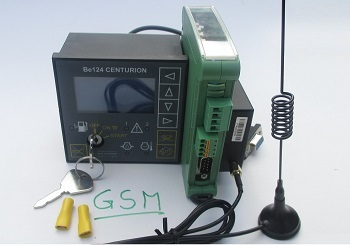 If the Be124 was in TEST or AUTO mode prior to power down, when you switch on the battery supply, the Be124 generator controller enters the AUTO mode of operation. In the other cases, you have to start the engine manually. Turn the key to ‘OFF’: you switch OFF the Be124 and clear the fault alarms. You are allowed to program the parameters or modify the settings (see 22.0 ). The backlight of the display will shutdown automatically after a 30 minutes timeout (it is programmable; see 9.0). To exit the OFF mode turn the key to ‘ON’. Turn the key to ‘ON’ position. After the automatic 5 second self-check turn the key to ‘START’ position until engine starts. The display will automatically show the ‘Be124 Status’ page. During cranking, depending on the efficiency of the battery, the generator controller may turn off the backlight of the display. Wait until the green LED GCB-ON starts blinking: it means that the generator is working within the settings. Push the [GCB](*) push button to close the generator circuit breaker: the green LED [GCB] will light and remain lit. Use the arrow buttons to browse the instrumentation. Push [ACK] at anytime to open the ‘Be124 Status’ page. Push the [GCB] pushbutton to open the generator circuit breaker. To stop the engine, turn the key to ‘OFF’ position; the messages [MODE OFF] & [STOPPING] will appear on the display for the programmed 'Stop Solenoid' time. After a complete stop, you can restart the engine. (*) If the generator parameters (e.g. V/Hz) are outside limits, the generator controller may trigger an alarm activation. 1.3 - AUTO mode (Automatic mode of operation) !!! WARNING: ENGINE MAY START IMMEDIATELY !!!! 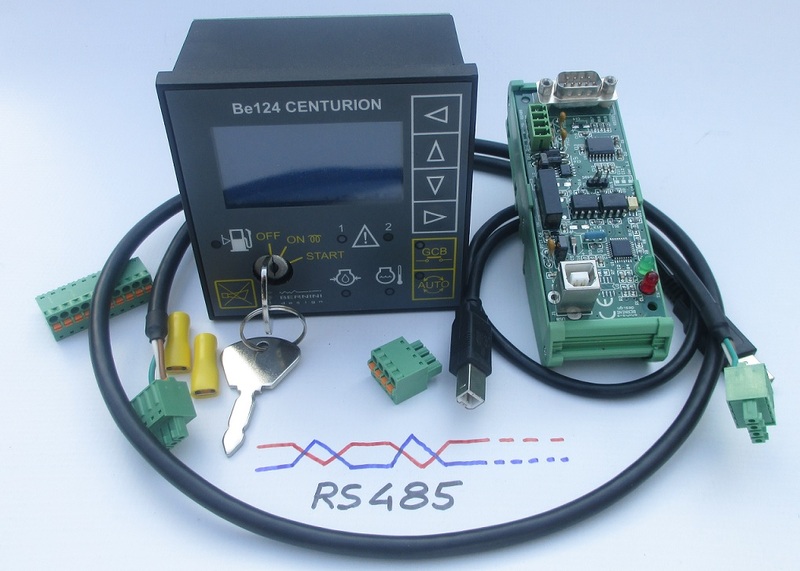 The Be124 generator controller can start the engine at anytime. Do not work on equipment, which is controlled by the Be124. When servicing the engine, disconnect the battery and battery charger. We recommend that warning signs be placed on equipment indicating the above. Turn the key to ‘ON’ position. Push the [AUTO] push button until the yellow LED [AUTO] illuminates. The engine starts when the generator controller detects a request to start from a configurable input. The green LED GCB blinks when the generator is working within the programmed limits. After the [WARM UP] time, the generator circuit breaker (GCB) will close automatically. Use the arrows to browse the instrumentation. Push [ACK] at any time to display the ‘Be124 Status’ page. When there is a request to stop the engine, the generator controller opens the GCB and triggers the [COOL DOWN] time. After that, the Be124 will stop the engine. In auto mode of operation, the generator controller will periodically test the engine if the scheduler is correctly programmed . During the test, the yellow LED [AUTO] will continue to blink; the display indicates the message [TEST]. To stop the engine, turn the key to ‘OFF’ position at any time. The display continuously informs you about what Be124 is doing. The engine will start when you program the AUTO START function as well. 1.4 - Generator Controller TEST mode !!! WARNING: ENGINE MAY START IMMEDIATELY !!!! Turn the key to ‘ON’ position. Push and hold the [AUTO] push button for at least 10 seconds until the display indicates the message [TEST MODE] and the yellow LED AUTO starts blinking. The generator controller will start the engine immediately. The generator controller will enable the generator circuit breaker (GCB) only if not otherwise programmed by the parameter [GCB TEST CONTROL]. To exit the ‘TEST’ mode, push the [AUTO] push button: the generator controller will enter the ‘MAN’ mode of operation.